Sunday Photo; Yeon Ju Dae – Wake Up and Laugh! For a while, I’ve been challenging myself to find a nice photo that suited either the weather or the season, if not both. This usually involved digging deep into the archives of my photosite (or my memory) to find just the right image. this week, I thought I’d save the hassle and post one hot off the press! 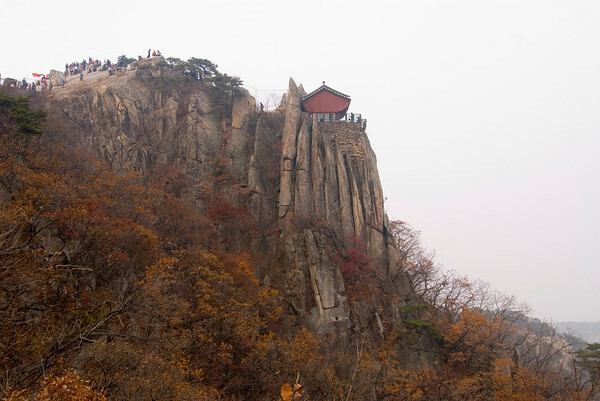 The great part about the hike is, just before you reach the peak, there is a large hermitage, Yeon Ju Am, buzzing with hiking-practitioners. If you make it between 6-9am or 12-2pm you’re welcome to join the crowd for a free meal. We got there at 2:10, but an enthusiastic Ajumma shouted into the kitchen that a foreigner was there so please make two more dishes! My wife is Korean, but I’m sure she enjoyed the special treatment, anyway… The food is simple, spicy, and salty, but after a hike up the mountain, it’s just as good as fine-dining! More for the foreigner! Yum!